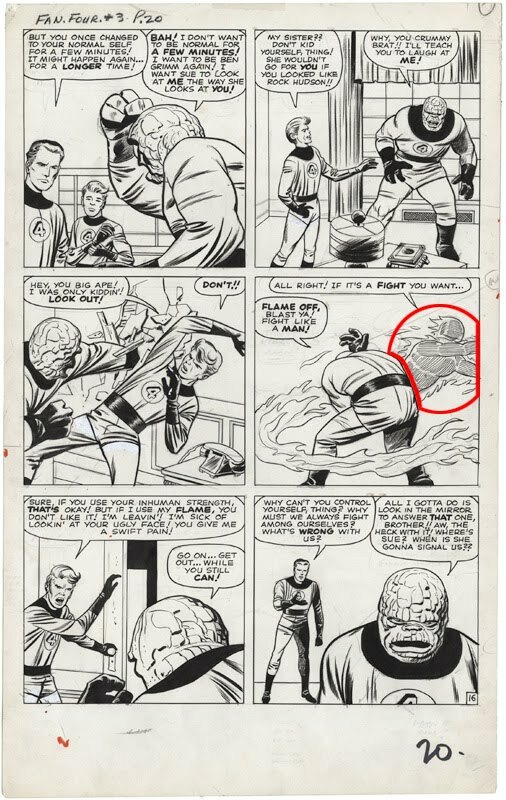 Over at the Kirby Museum, Rob posted some original art from Fantastic Four #3. What's interesting is that on the back of page 16 is a series of sketches for possible logos to use on the FF's costumes. I sent off an email to Rob with some additional ideas/comments, but I thought I'd repeat it here because... this kind of stuff interests me. Here, though, I've also included some highlighted art for clarity. 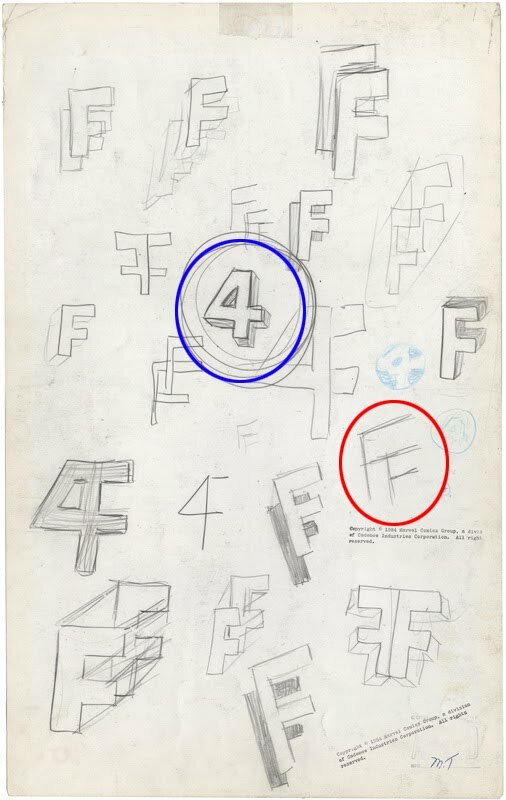 The logo sketches were most likely Stan Lee's work. Some of the other earlier FF pages indeed have rough (i.e. really bad stick figures) "layouts." It's possible that someone else could have done them, but A) it almost certainly wasn't Jack and B) not many other people would've had access to the original art. Now, the other possibility for the logos could be Sol Brodsky. He appears to have done some elaborate re-work on the Human Torch figures throughout that issue (at right, circled in red) to bring him more in line with the original Carl Burgos design. So Brodsky would have had access to the art boards, and he did create the "Fantastic Four" logo that shows up on the cover. As for the sketches showing up on page 16 instead of 7, that doesn't strike me as particularly odd. Jack wouldn't have only turned in one or two pages at a time, he turned the art for an entire story at once. So when Stan (or Sol) opted to doodle some new logo ideas, he could've grabbed any page from the story at random. Notice also that when Sue first steps out in costume, her boots have high heels! Jack was always doing this, whittling down the details of character designs while the story was actually in progress! Look back at the first appearance of The Destroyer in Thor, and you'll see its body design actually get simpler from page to page!